Traditional Japanese curry tends to be thick, creamy and heavy, but soup curry has a watery and light consistency. 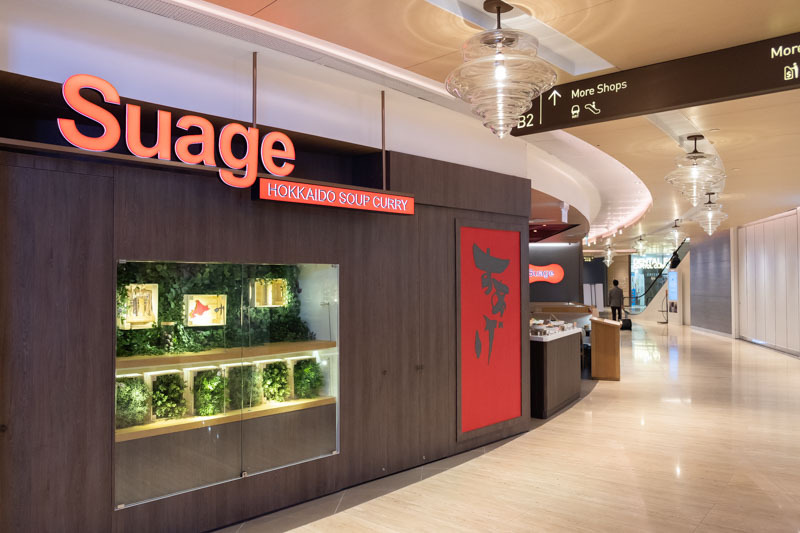 Suage, Hokkaido’s number one soup curry restaurant has finally opened an outlet in Singapore, at Capitol Piazza. Finding a seat shouldn’t be an issue, because the restaurant is able to accommodate up to 80 diners. When it comes to ordering at Suage, there are only two steps. First, order the dish of your choice. Second, choose your preferred spicy level, ranging from zero to ten. To be safe, we ordered spicy level three for all of our dishes. All the dishes come with assorted vegetables and a hard-boiled egg. The base soup is the same as well, which made us a little curious about how each dish will taste different from each other, apart from the different meat selection. Three pieces of tempura prawns and a slice of avocado made up the Prawn & Avocado ($14.50). I found the proportion of meat to vegetables to be rather skewed as I was expecting more meat. Remember to stir the soup curry as the chilli powder sinks to the bottom of the curry. We recommend squeezing some lemon juice onto the Japanese rice to enhance its flavour — the tanginess from the rice gives the curry soup a little zest when eaten together. I enjoyed the light and watery consistency of the soup and found the spicy level to be optimal. The mild spiciness tingled my tongue, and the sweet curry broth had a similar consistency to tomato soup. The crispy tempura prawns turned soggy from sitting in the broth too long, but the prawns used were succulent. The avocado was fresh and creamy, which added a contrasting texture to the dish. We liked how the assorted vegetables were grilled and had soaked up the soup curry’s flavour. Replace the prawns and avocado with beef slices and you have the Beef Shabu Shabu ($14.50). An adequate portion of sliced beef was served together with the assorted vegetables. Unfortunately, the beef slices looked dry and tough. Tastewise, they were overcooked and lacked flavour. It was a pity, because I had high expectations for the Beef Shabu Shabu. In the end, I was enjoying the assorted vegetables and broth more than the beef slices. Our particular serving could be an outlier though, so I’ll let you decide. We moved on to the Pork Kakuni ($13.80), a dish recommended by the chef. Thick cuts of stewed pork belly were neatly placed atop the assorted vegetables. The Pork Kakuni was delicate, and the fats melted in my mouth. Though it was a little gamey, I enjoyed that subtle hint of porky flavour. For this dish especially, I liked how the lightness of the broth went hand in hand with the denser stewed pork belly. You can never go wrong with chicken, which explains why the Chicken Kushiyaki ($13.80) is also a popular choice among diners. Two pieces of gently-seared chicken were served on satay sticks. The portion of chicken was really little as compared to the number of assorted vegetables in the bowl. I was trying my best to savour every bit of chicken because it was just too modest a portion. Don’t get me wrong, the chicken was good; it was nicely seared, and the meat was tender. But before I could even fully appreciate the chicken, only the satay sticks remained. If you haven’t tried soup curry, Suage is the place to go. There’s definitely room for improvements, such as the portion size and the overcooked beef. Apart from that, I wouldn’t mind visiting this restaurant for a meal again.